This IBM® Redpaper™ publication is a comprehensive guide that covers the IBM Power System™ E850C (8408-44E) server that supports IBM AIX®, and Linux operating systems. The objective of this paper is to introduce the major innovative Power E850C offerings and their relevant functions. The Power E850C server (8408-44E) is the latest enhancement to the Power Systems portfolio. It offers an improved 4-socket 4U system that delivers faster IBM POWER8® processors up to 4.22 GHz, with up to 4 TB of DDR4 memory, built-in IBM PowerVM® virtualization, and capacity on demand. It also integrates cloud management to help clients deploy scalable, mission-critical business applications in virtualized, private cloud infrastructures. Like its predecessor Power E850 server, which was launched in 2015, the new Power E850C server uses 8-core, 10-core, or 12-core POWER8 processor modules. However, the Power E850C cores are 13%-20% faster and deliver a system with up to 32 cores at 4.22 GHz, up to 40 cores at 3.95 GHz, or up to 48 cores at 3.65 GHz, and use DDR4 memory. A minimum of two processor modules must be installed in each system, with a minimum quantity of one processor module's cores activated. Cloud computing, in its many forms (public, private, or hybrid), is quickly becoming both the delivery and consumption models for IT. However, finding the correct mix between traditional IT, private cloud, and public cloud can be a challenge. The new Power E850C server and IBM Cloud PowerVC manager can enable clients to accelerate the transformation of their IT infrastructure for cloud while providing tremendous flexibility during the transition. IBM Cloud PowerVC Manager provides OpenStack-based cloud management to accelerate and simplify cloud deployment by providing fast and automated VM deployments, prebuilt image templates, and self-service capabilities all with an intuitive interface. PowerVC management upwardly integrates into various third-party hybrid cloud orchestration products, including IBM Cloud Orchestrator, VMware vRealize, and others. Clients can simply manage both their private cloud VMs and their public cloud VMs from a single, integrated management tool. IBM Power Systems is designed to provide the highest levels of reliability, availability, flexibility, and performance to bring you a world-class enterprise private and hybrid cloud infrastructure. Through enterprise-class security, efficient built-in virtualization that drives industry-leading workload density, and dynamic resource allocation and management, the server consistently delivers the highest levels of service across hundreds of virtual workloads on a single system. 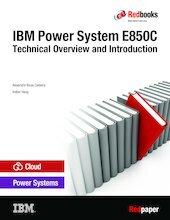 This paper expands the current set of IBM Power Systems documentation by providing a desktop reference that offers a detailed technical description of the Power E850C system.